Dr Michael Stevens at the Bluff signpost to the world. In 1807 Napoleon closed Russian ports to British traders, starving the Royal Navy of crucial hemp and spar supplies. By 1813, attempts to find alternative sources had reached New Zealand – New South Wales merchants sent a ship to investigate flax growing in and near Bluff, and Māori methods of manufacturing fibre from it. 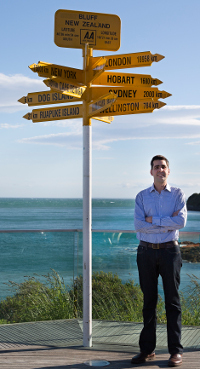 By making such connections, University of Otago historian Dr Michael Stevens can view his hometown of Bluff through an international lens, reshaping our thinking about New Zealand’s economic history and race relations. Have international connections in New Zealand history been ignored in the past? I think people who lived in New Zealand in the late nineteenth and early twentieth century generally were much more conscious of New Zealand’s connections across and beyond the British Empire—the place of the world in New Zealand, as another historian has put it—than subsequent generations. Since the mid-twentieth century especially, the focus has been much more on New Zealand’s place in the world. This has been driven by a nation-centred approach to history that means a lot of research and writing on New Zealand’s colonial past has occurred surprisingly independent of its wider empire context. Scholarship that connects the Bay of Islands and Foveaux Strait to New South Wales in the 1790s, and the Waikato to India, Jamaica, and British Columbia in the 1860s, illuminates the histories of these interconnected places in ways not possible when examined in isolation from one another. Conversely, why are you focusing on the history of one small town? Another problem with this national approach to New Zealand history is that it aggregates (and ignores) different people and parts of New Zealand and then sort averages them out into a general picture that often does not reflect any particular place in these islands. Regional case-studies, or even smaller micro-historical studies, of towns for example, offset this problem to some extent. However, in my close-study of this small industrial port, I am wanting to tease out its connections with distant shores, events and processes. A world history of Bluff is therefore something that is both smaller and bigger than New Zealand history as the term is typically understood. Is the history of Bluff a story of race relations in particular? To a large extent, yes. In the 2006 census 15% of all New Zealanders self-identified as Maori. The figure for Southland as a whole, that is to say, including Bluff, was 11.8%. The figure for Bluff in and of itself meanwhile was 43%. That is clearly quite a difference and one is moved to ask why? A related question is what has been the nature of being Māori in this place over the last two centuries? Being a “Bluffie” of Kāi Tahu descent means that I have some sense of the answers to these questions. For instance, the last Kāi Tahu native speaker of te reo Māori is thought to have died in the mid-1940s so this variant of Māori culture does not have language at its core. This is one effect of interracial marriage, which occurred in the south much earlier and more intensively than most other parts of New Zealand. However, seasonal resource extraction—muttonbirding, shearing, oystering and crayfishing—is an enduring feature of life in and around Bluff. A lot of Māori there likewise work on the wharf. In other words, the sea and the coast are carved into this community, but the stories of so-called littoral people are not very prominent in New Zealand or Māori history, which I hope to turn around. Did 19th century Māori come to Bluff because they had lost land elsewhere? Yes and no. On the one hand, landlessness forced Māori into manual work such as in freezing works and on wharves, which Bluff had. On the other hand, many of these people strongly preferred life at sea rather than on land; fishing over farming. This is especially true of so-called “halfcastes” whose fathers were typically whalers and sealers. The proximity of Bluff to customary land that was retained during the colonial encounter is also an important aspect of Kāi Tahu consolidation in Bluff. The obvious examples here are the Tītī/Muttonbird Islands and Ruapuke Island, but also parts of Rakiura/Stewart Island such as The Neck. Is the role of the ocean understated in Bluff’s history? The role of the ocean in Bluff’s history is not lost on many people who live and work there, nor other New Zealanders who are based in port zones. However, the role of the ocean is massively under-appreciated by New Zealanders who are not familiar with those places or the functions they serve. We talk about the divide between rural and urban New Zealand but there is another one between terrestrial and maritime New Zealand. For the first three or four decades of New Zealand’s colonial history, its main centres were connected to one another by sea, not land; ships, not trains. We were likewise exclusively connected to the rest of the world by ships until well into the twentieth century. Even today something like 90% of our imports and exports (by weight) travel by sea. We are an island people and though our academic history does not make that clear, a study of Bluff should serve as something of an overdue corrective.